April 15, 2019 Los Angeles Angels recalled RHP Jaime Barria from Salt Lake Bees. April 11, 2019 Los Angeles Angels optioned RHP Jaime Barria to Salt Lake Bees. April 10, 2019 Los Angeles Angels recalled Jaime Barria from Salt Lake Bees. 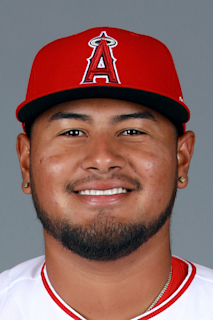 March 27, 2019 Los Angeles Angels optioned RHP Jaime Barria to Salt Lake Bees. July 23, 2018 Los Angeles Angels recalled Jaime Barria from Inland Empire 66ers. July 12, 2018 Los Angeles Angels optioned RHP Jaime Barria to Inland Empire 66ers. June 12, 2018 Los Angeles Angels recalled Jaime Barria from Salt Lake Bees. June 2, 2018 Los Angeles Angels optioned RHP Jaime Barria to Salt Lake Bees. May 26, 2018 Los Angeles Angels recalled Jaime Barria from Salt Lake Bees. May 16, 2018 Los Angeles Angels optioned RHP Jaime Barria to Salt Lake Bees. May 3, 2018 Los Angeles Angels recalled Jaime Barria from Salt Lake Bees. April 23, 2018 Los Angeles Angels optioned RHP Jaime Barria to Salt Lake Bees. April 22, 2018 Los Angeles Angels recalled Jaime Barria from Salt Lake Bees. April 12, 2018 Los Angeles Angels optioned RHP Jaime Barria to Salt Lake Bees. April 11, 2018 Los Angeles Angels recalled Jaime Barria from Salt Lake Bees. March 10, 2018 Los Angeles Angels optioned RHP Jaime Barria to Salt Lake Bees. November 20, 2017 Los Angeles Angels selected the contract of Jaime Barria from Salt Lake Bees. August 22, 2017 RHP Jaime Barria assigned to Salt Lake Bees from Mobile BayBears. June 4, 2017 RHP Jaime Barria assigned to Mobile BayBears from Inland Empire 66ers. April 5, 2017 RHP Jaime Barria assigned to Inland Empire 66ers from Burlington Bees. September 7, 2016 Burlington Bees activated RHP Jaime Barria from the 7-day disabled list. September 1, 2016 Burlington Bees placed RHP Jaime Barria on the 7-day disabled list. April 2, 2016 RHP Jaime Barria assigned to Burlington Bees from Orem Owlz. July 30, 2015 RHP Jaime Barria assigned to Orem Owlz from AZL Angels. June 20, 2015 RHP Jaime Barria assigned to AZL Angels. April 11, 2013 Los Angeles Angels signed free agent RHP Jaime Barria to a minor league contract.